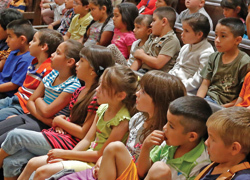 One of the most important aspects of the Santa Fe Chamber Music Festival’s mission is to provide educational opportunities to local students year-round. Programs such as Music in Our Schools, Strings in Our Schools, Guitars in Our Schools, and Youth Concerts provide immersive, hands-on experiences to a range of students from pre-K through grade six and expose them to music from the classical repertoire and beyond. In the 2017–18 season, Music in Our Schools will present concerts in 12 schools that center on three themes: the Guitar Duo (in September and October), the String Quintet (in November), and the Jazz Quartet (in March). Through Strings in Our Schools, which began in 1995, students in four local elementary schools that don’t otherwise offer string-based music instruction enjoy free weekly, hour-long violin lessons at the beginner- and intermediate-levels. 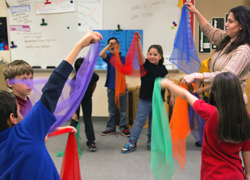 The classes comprise small groups of students and are taught during school hours (and at Tesuque Elementary School after hours) by longtime Festival collaborator Hilary Schacht. Students use instruments the Festival loans to them and, at the end of the year they perform in group concerts at their own school and district-wide . This season, 74 students will participate in Strings in Our Schools. The Festival’s newest program, Guitars in Our Schools, launched in 2016 and is based exclusively at the Kha’p’o Community School in the Santa Clara Pueblo. Led by Roberto Capocchi, the program is a hands-on after-school enrichment initiative that allows students to learn various aspects of guitar-playing through one beginner- and one intermediate-level group class each week. A mainstay of the Festival since 1983, the Festival’s four annual Youth Concerts are enduringly popular events that make classical music fun and accessible to children of all ages. Held during the Festival’s official summer season in St. Francis Auditorium at the New Mexico Museum of Art, the concerts feature excerpts from that season’s repertoire, performed in highly engaging ways by that season’s musicians. In 2018 the concerts — which are estimated to reach around 1,000 students — will be held on July 16, July 23, July 30, and August 6.